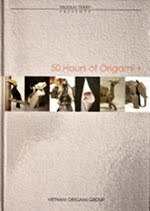 i really want to get this book, and i saw that it goT alot of 5 star ratings on origami shop.com. but i just wanted to know, what is the average paper size for most of these models? Also, what are your oppinions on the book? Well, there are quite a few models in there that you can fold from small sheets. But there's also some super complex models in there, and those will benefit from large sheets - i.e. will be almost impossible to fold from small sheets. And then there's some models that don't appeal to me personally, and which I probably won't fold. However, that's true for most books I have, I'm somewhat picky I have to admit with respect to which models really spark my interest and get me folding. I guess it's the consequence of having lots of selection (so many people creating beautiful models these days! ), but not extremely much time to fold. You start picking out the very best bits. Of course, what's "the best bits" is a matter of taste. Some models others rave about I am not inspired by, and some models I absolutely adore aren't everyone's favorite. Therefore I'd suggest you take a look at the table of contents pages on origami-shop and decide for yourself whether there are enough models in the book that you find pleasing. That's what I did, and for me it was an easy decision - more than plenty of models, which really speak to my aesthetic. As to the quality of the print publication, Nicolas Terry produces high quality books, so that is not a concern. thanks alot for your response! i really do greatly appreciate it. and yes i think i will buy this book, i love the owl, mouse, horse, and sumo wrestler in it. i bought origami essence and believe that this book will be even better.